Our Adventist Family Berm is a general admission area on a grassy hill, which overlooks the field. Being the family-friendly side, guests are encouraged to bring a chair or blanket to sit on. Select chairs will be available for purchase or rent (subject to availability). First come first serve! View from the Adventist Health Portland family berm in Left field. Our Right Field Berm is a general admission area on a grassy hill, which overlooks the field. Guests are encouraged to bring a chair or blanket to sit on. Select chairs will be available for purchase or rent (subject to availability). First come first serve! View of Right Field Berm toward home plate. Our Left Field Box Area, is a row of 10 picnic tables, right in front of the home bullpen. Guests must reserve the entire table, which includes six seats per table. New for this season: wait-service available for beverages and snacks. Our Right Field Box Area, is a row of 10 picnic tables, right in front of the away bullpen. Guests must reserve the entire table, which includes six seats per table. New for this season: Wait-service available for beverages and snacks. The Hot Corner Tent is a private group area along the third base line, next to the Pickles Dugout! Being the only covered area in the park, it provides some shade for those groups that book it in advance. All-you-can-eat hamburgers, hotdogs, sides, soda and water is included in the group rate, and catered right in that area. Can book 40 people for half the tent, and 80 for the entire tent. Please call Kevin at 503-774-1354 or email kherbst@portlandpicklesbaseball.com for more information! The Third Base Dugout Den is the closest you can get to the Pickles Dugout! This area is a private group area. Fans get so close they’re practically in the game! Guests can book up to 20 guests in this area, with food not being included. Please call Kevin at 503-774-1354 or email kherbst@portlandpicklesbaseball.com for more information! View from the Third Base Dugout den. This is a private guest area for our owners and partners. There is, however, a full bar, open to fans throughout the game. Harry Canary enjoying the view from the Northside Ford Party deck. Fans on the Northside Ford party deck #raisethechairs after the Pickles score. This area is a private group area, next to the opposing dugout. Fans get so close they’re practically in the game! 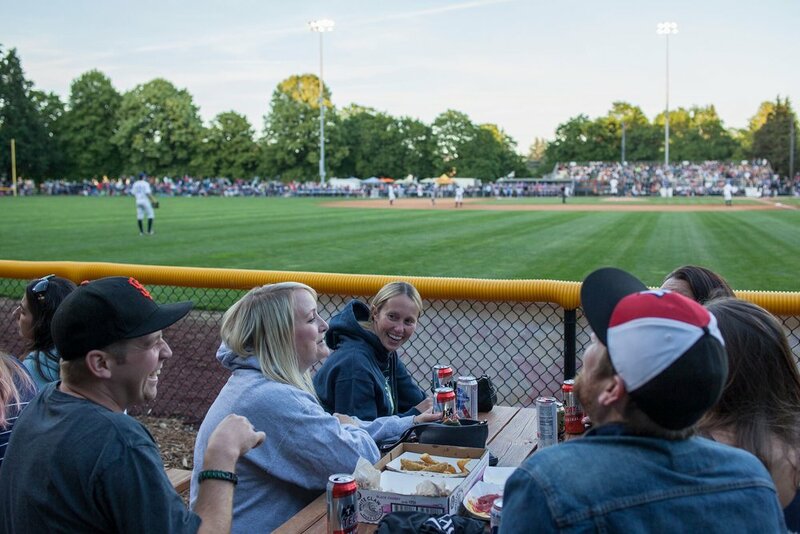 Guests can book up to 25 guests in this area, with all-you-can-eat hamburgers, hotdogs, sides, soda and water is included in the group rate, and catered right in that area.Please call Kevin at 503-774-1354 or email kherbst@portlandpicklesbaseball.com for more information! View from the First Base Dugout den which is directly next to opposing team dugout. The new Deschutes Party Plaza is a private group area. New for this season, there will be a new bar, that will serve into the group area, and also into the right field berm. Still being kid-friendly, the Deschutes Party Plaza is for the big groups. Individuals can book 50 people, 100 people, or 150 people. Please call Kevin at 503-774-1354 or email kherbst@portlandpicklesbaseball.com to book your group today. Our newest general admission area lies adjacent to the Pickles bullpen behind the left field fence. The area is mostly standing room with limited seating options. The new bullpen bar will be only feet away and feature ball park favorite snacks and beverages.